“Let’s talk science…” A closer look at hair will make you see beyond what you normally see and touch. See what the naked eye cannot see. After all, this is where the process of permanent wave, permanent hair straightening, Thermal Reconditioning, color, bleach and highlights begins; in the cortex (disulfide/cystine bond). It is here where the chemicals transform and rearrange the natural curl pattern of the hair from curly to straight, and vice versa. A Closer look at hair through the microscope. Principle Based Science is about understanding "the big why". Understanding the "why" and we'll understand how to gain a more thorough understanding of the hair with which we work, and how to apply our knowledge to be successful in the professional salon industry, and at-home. Once we own the information, we don't have to think about the fundamentals, the mechanics or the disciplines. It’s not that we don't utilize them; it's that we don't have to think about them. We use them instinctively. When you own the information, you automatically do it correctly. This is when we can truly be creative. Whether it's Michael Jordan sinking a basket, Albert Einstein theorizing a new mathematical equation or Leonardo Da Vinci creating a new masterpiece, they don't think about the text book way they learned to do their craft, they just do it. All matter, whether liquid or gas is composed of elements, the building blocks of life. There are 106 elements, five of which are important to the study of hair and skin. Hair is comprised mainly of non-living protein called keratin. Proteins are chains formed by amino acids. These acids are linked together lengthwise and held together by peptide bonds. Keratin protein contains five elements. These five elements are: Carbon, Hydrogen, Oxygen, Nitrogen and Sulfur. Human hair is divided into two basic parts: hair root and hair shaft. The root is found beneath the surface of the skin. In the root area, the hair grows up through a tube-like depression called a follicle. At the bottom of the follicle is the papilla, where hair is formed and melanin is created. This is considered the “living” part of hair, where growth and regeneration of cells occur and blood and nerves exist. The visible part, or hair shaft is non-living keratin divided into three layers: cuticle, cortex and medulla (The medulla, when present, is the innermost layer running down the middle of the hair shaft. In humans, it has no known function). Electrical charges, positive electrons which have a (-) negative charge. These electrical charges, positive attracted to negative and vice versa create the energy for atoms to combine or bond together and form more complex units called molecules. Amino acids are one kind of molecule. These are the building blocks of hair and skin protein. There are 22 amino acids, though only 19 of them are found in the keratin protein of the hair and 17 found in the collagen protein structure of the skin. Amino acids link together in a specific order and arrangement to create proteins. Although amino acids are all proteins, each protein is different because of the way it is put together. Amino acids link or bond together, end-to-end, to form larger groups of amino acid chains that are commonly referred to as peptide or poly-peptide chains. When you consider that there are only 10 numbers which make up every phone in the world…the endless opportunity for different combinations of the 22 amino acid molecules is easier to comprehend. As we discovered, the structure of the hair and skin is composed of proteins. When at least 50 amino acids have linked together to form a large molecule, and its molecular weight is 5,000 or more, it is then described as a protein. As peptide bonds link amino acids together end to end there are three different bonds that link or join amino acids together side by side to form three-dimensional structure. Each of these bonds behaves differently, and serves a different purpose in building the structure of hair. These bonds work on the principle that unlike charges attract. Hair has many hydrogen bonds, and they tend to be weak and break apart easily when exposed to water or heat. They serve to organize the proteins, and make up about 35% of the hair’s resistance to change. So, they keep naturally curly hair in its curly form. Like hydrogen bonds, the salt bonds work on the principle that unlike charges attract too. The salt bonds are largely affected by changes in pH and by water and make up another 35% of the hair’s resistance to change. When the hair is “set”, for example, both the salt and hydrogen bonds are affected by the application of water along with the tension of rollers or brushes in conjunction with the evaporation of water as the hair dries. This allows for a “set” of changes, which affect these salt and hydrogen bonds that are not permanent. When two adjacent protein chains align with the element sulphur in their side groups, this most important bond occurs. This happens when two Cysteine amino acids are joined by a disulfide bond to create a new amino acid called cystine that locks the hair in its three-dimensional shape. When we give a TR/Japanese Straightening service, the reducing agent actually breaks down the disulfide bond, and cuts the cystine in half to create two cysteines. These are later re-bonded through a chemical action to re-create cystine. The disulfide bond is responsible for giving hair its stability and strength. This process of bonding amino acids together happens countless times over to produce the living tissues and appendages of our bodies. Of great interest to us in this discussion is the protein composition of the hair. This fibrous structure is composed of three different types of keratin protein. Formed by spiraling or helical protein chains, which are immersed in a bed of amorphous proteins. The cortex or middle layer is composed of softer, more pliable spiraling chains of protein, which give hair its strength and elasticity. Flat platelets of hardened keratin. The cuticle is the translucent, outermost portion of keratin that protects the inside of the hair shaft. It is generally seven to ten layers thick, with scales that overlap each other like shingles on a roof. We’ve seen pH’s written for solutions and products. Just what is pH and how is it related to what we do within the professional beauty industry? Prior to 1960’s, only two groups of individuals were particularly interested in pH, medical professionals and farmers. The pH of one’s blood is extremely important to doctors and nurses, a minor change can quickly lead to severe medical emergencies. Farmers have learned that certain plant grow and produce better in soil of certain pH’s. Yet what does pH mean? The letters are abbreviated for potential Hydrogen. Simply explained, a given pH is a reading (unit of measurement) of positive hydrogen ions compared to negative hydroxyls in an aqueous (water) containing solution. Just as degrees measure temperature, and inches distances, pH numbers measure the amount of acid or alkali in a water based solution. Keep in mind that only solutions containing water and products that dissolve in water can have pH value. The pH scale is numbered from 0 to 14, which would make 7 an exact centre point. At a pH of 7.0 a water solution has the same number of hydrogen ions and hydroxyls and is therefore called NEUTRAL. When positive hydrogen ions are increased the pH will drop below 7, therefore this solution is an ACID. A solution that has more hydroxyls will be above 7, and will be ALKALINE. The pH scale is logarithmic, which means each point value or number increases in multiple of 10. In other words, pH 6 is 10 times more acidic than pH 7, and a pH 5 is 100 times more acidic than pH 7, and so on until you reach 0, which is 10 million times more acidic than the neutral solution of pH 7.0. 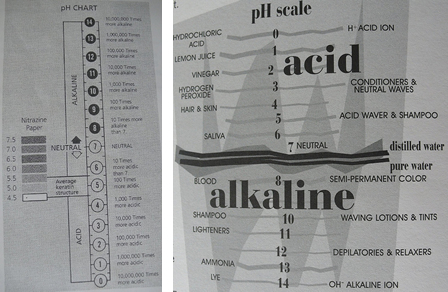 We’ve been told that a low acid pH is good for our hair, skin and scalp and that a high alkaline pH is less desirable. This statement is partly true when pertaining to products like shampoos, reconditioners or skincare. However, there are some salon services such as perms, haircolor, relaxers, Japanese hair straightening/Thermal Reconditioning/TR that rely on higher alkaline pH chemicals to work properly. Early hair and skin care products were primarily made from fats, oils and waxes that coated and produced a barrier on the surface of the hair or skin. They added shine and smoothness, but did nothing to reinforce the inner structure of the hair or skin. Damage was masked temporarily, but never really treated. Further studies of the structure of hair led to the discoveries that allow us to know and understand the actual composition of the hair. • .1-.5% Carbohydrates – intercellular cement that binds moisture and proteins together. This newfound knowledge of the hair’s composition has helped to further establish proof that topically applied proteins and moisturizing solutions (formulated with the appropriate ‘bonding” capabilities) can dramatically improve weakened and sensitized hair and skin. Hair care products that are based on the scientific principles of hair and skin as well as proven evidence that when carefully formulated, such topically applied proteins and moisturizers can be absorbed into the hair and skin to produce long-term improvements or conditioning. The revelation enabled salon professionals to condition hair internally rather than just camouflage the damage. The result: long term strengthening of the hair fiber, which improves, in part, the look and durability of perms, hair color and Thermal Reconditioning/Japanese Hair Straightening. This phenomenon of using applied science to products and services performed in salons and at-home has forever changed product formulation in both the professional and retail sector of the beauty industry. Hair is described as fine, medium or coarse, which represents the actual diameter of a cross section of an individual hair. It is common among different racial groups to see consistencies in relation to hair diameters. The specific diameter of hair has a very definite effect on its behavior. The width of a cross-section of hair, also known as texture. The ratio between the space the cuticle occupies compared to that of the cortex in the diameter of the hair is significant. Remember the protein of the cortex is different from the protein of the cuticle. The cuticle contains hard, resistant layers, (generally 7-10) which lay flat to protect the inside of the shaft which is called the cortex while by comparison the cortex has a soft elastic quality due to spiraling chains of protein. When a particular hair is 90% cortex and 10% cuticle that hair behaves more like the cortex – with more elasticity and the ability to be molded and reshaped, holding a set or a permanent wave, TR and BKT very well. On the other hand, if the cuticle makes up as much as 40% of the hair’s diameter, it will behave more like the cuticle which is more resistant to perming, TR and BKT, rather inflexible and easily damaged. The abundance of the hair, also known as density, is the amount of hair upon the scalp head per square inch. We classify this as sparse, average, or thick (dense). The amount of hair on our bodies is a genetic factor and varies from person to person. A person with fine hair usually has less density per square inch than a coarse haired individual. The amount of hair on each individual’s body is a genetic factor, which varies tremendously from person to person. The diameter of the hair doesn’t necessarily indicate the density across the surface of the scalp. Though, it is not unusual to see an individual with fine hair also having a lower density of hairs per square inch, and an individual with coarse hair having a thicker density. Hair density is always affected by the percentage of hair in the anagen, catagen or telogen stages – while a woman is in pregnancy her hair will remain longer in the anagen stage of growth. Following child birth, much of her hair will move rapidly through the catagen stage and directly to the telogen phase. The appearance is “sudden hair loss” and thinning hair”. Actually, the loss of hair is the body’s functional balance returning to normal. In actual fact, the average head is approximately 120 square inches (74 cm2). That’s around 1,000 hairs per square inch (6.5 cm2). Blonde haired people often have an average of 140,000 hairs on their heads. Those with brown hair have about 110,000, black hair around 108,000, and red, approximately 90,000. Determining abundance helps to define the size of the parting required for TR, BKT, haircolor application. Hair with sparse abundance may require ¼-inch partings, while hair with average to coarse abundance may require 1/8-inch partings to insure proper product saturation and/or ironing in doing a TR/ BKT. Hair formation – generally described as straight, wavy or curly – must also be considered prior to a TR, BKT or a haircolor service. When the hair grows outward towards the surface, the individual hair fibers project from the scalp in straight or wavy pattern, which are angled at varying degrees. In hair that is excessively curly, the follicles are projected at a much stronger angle (i.e. the bulb region is almost parallel to the surface of the scalp). Furthermore, the hair bulb itself is retroverted, or bent on a strong angle – much like the appearance of a golf club. In contrast, hair follicles in straight or wavy hair project at only a slight angle to the surface. Try thinking of hair as pasta: Straight hair-spaghetti (round), wavy hair-linguini (oval) and curly hair-fettuccini (flat). Evaluating the condition of hair prior to TR, BKT, haircoloring/highlight. Once you know the texture and abundance and condition of the hair, you will need to determine its condition. This important step is always taken into consideration and corrected in order to achieve successful TR, BKT and haircolor results. Visual examination of the hair can reveal whether the hair is dry or oily, virgin or chemically treated, over-processed, dull, or healthy. The hair can also be physically evaluated to determine if it has good elasticity or it is porous or damaged. An elasticity test assesses hair tensile strength. Remove a strand of hair from the side of the head above the ears. Hold it between your thumb and forefinger. With the thumbnail and index of nail of the other hand, run the distance of the hair rapidly, as you would curl a ribbon with scissors. This should create a series of small curls. Then, gently pull the hair straight for 10 seconds and release. If the hair completely or almost completely returns to the curl pattern, it has good elasticity. If it returns only 50% or less, it is structurally weak and may require protein treatments. Damaged hair is often the result of excessive environmental, chemical, thermal or mechanical styling stress. It may be weak and brittle when dry, spongy or stretchy when wet. Damage may be externally or physically obvious, or internal. To determine if the cuticle is damaged, perform this simple test; separate a 1 to 2 inch section of hair and hold it firmly between your thumb and fingers. Slide the thumb and forefinger of your other hand along this section from the ends toward the scalp. If the hair seems to easily tease or “back-comb” between your fingers, the cuticle is damaged (note; this test is not effective with curly hair types). Usually, damaged hair requires moisture and protein treatments to reinforce and help return it to a healthy state. Over-porous hair can be caused by excessive heat styling, bleaching, coloring, or other chemicals such as TR, BKT, relaxers and permanent waves. It may feel slimy when wet and brittle when dry. Porosity needs to be considered when selecting TR and hair coloring products – it determined formula mixtures and processing times. When the hair is weakened or in poor condition, it is advisable to treat it and ensure the best possible TR, BKT and hair color results. The structure of the damaged hair is considered ‘disordered”. Internally, the fibrils of the cortex may be separated in spots causing hair to be weak and over-porous. Damage to the cortex can be caused in a number of ways. Styling tools such as a dryer used too close to the hair, or a hot iron left on too long can actually melt the cortex. Improper use of perms, TR, BKT, relaxers, lighteners, tints and over-exposure to the sun can also damage the cortex. The result: weakened, dry, brittle and dull-looking hair. 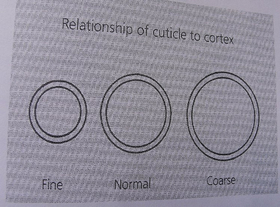 Usually if the cortex is damaged, the cuticle has been damaged too. A damaged or “abraded” cuticle is often the result of mechanical friction to the fiber. Wet-brushing and combing, towel-drying, repeated use of thermal styling equipment, improper cutting techniques, teasing, braiding, use of rubber bands and tight clips all cause breakage of the cuticle scales. Melted cortex by over pressing with the iron. “Split ends” are another form of hair breakage. They start as cracks in the cuticle which eventually deepen and break or “fray” the cortical bundles. If split ends aren’t cut off, the splits increase and the ends become completely frayed. It is to your advantage to recondition damaged hair and maintain its competency. Knotted hair caused by mechanical trauma and towel ruffling. Cuticle damage caused by intense heat from metal nozzle of hand held dryer. Mechanical damage caused by curling iron. hollow medullary canal at centre. Healthy hair. Notice continuous hollow medullary canal at centre. Growth refers to the stages at which there is active reproduction. The hair is being reproduced by means of 3 specific stages of activity or growth. The cells that make up a strand of hair produced in the hair bulb. The hair’s active growth stages is called the anagen phase. In an anagen bulb, cells are dividing, specializing and moving upward. In a normal, healthy scalp, 80 to 84% of the hairs are in the anagen phase. The transition from active growth to bulb maturity is referred to as the catagen phase. At this time the cells are dying, and the bulb takes on a broom-like appearance. When the bulb phases into the telogen phase, no further cells are produced. Ultimately, telogen hair falls out. 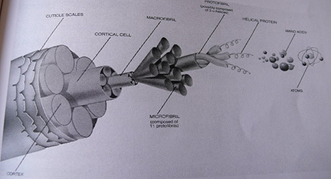 During the anagen stage, the hair bulbs (the living part of the hair) each have an attached root sheath and the germinal matrix cells are all in an active stage of cellular division and production. Once all cell division stops, the hair bulb moves into the second step of its life, the catagen or resting stage. The hair reaches the telogen stage when the hair bulb has no attached root sheath. Eventually, this will lead to the hair to fall out, and signals the cell birth layers to begin cell reproduction to start the process all over. It is estimated that the duration of the anagen stage is 2-6 years, the catagen stage only last a few months, and the telogen stage even shorter. Different types of hair also have different growth rates. For example, beard hair is similar to that of scalp hair, eyebrow and eyelash hair that grows for about 10 weeks, and rests for 9-12 months before falling out. That is why eyebrows don’t seem to grow back much after they’ve been shaved, but seems to grow rapidly after being tweezed. Tweezing actually stimulates the anagen, or active growth stage to start. Illness, a low protein or unbalanced low diet in vitamins and minerals can have effects on the hair growth. In fact, anything that alters the physiological state of the body can, and probably will affect hair health and hair growth. Remember, each individual hair grows from an individual hair follicle, which is nourished by the blood supply and oxygen of the body. So, you say to yourself: “Where do I go from here?” I understand the language, and now I know how to take better care and to create beautiful hair, based on hair that is in optimum condition…simple, isn’t it ?